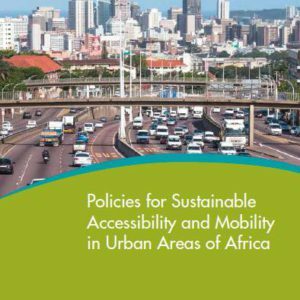 Prepared and published by the Sub-Saharan African Transport Policy Programme (SSATP) in 2015, this Working Paper is addressed to policy- and decision-makers, andproposes a set of policies which aim to improve accessibility and mobility in urban areas of Africa. Large and small, urban areas of Africa are currently experiencing the fastest population growth in the history of the planet. As a result, policy- and decision-makers face enormous challenges in meeting the needs of current and future urban dwellers. Proposes a conceptual framework and a set of policy recommendations meant to improve accessibility and mobility conditions in urban areas of Africa. The SSATP is a partnership of 40 African countries: Angola, Benin, Burkina Faso, Burundi, Cameroon, Cape Verde, Central African Republic, Chad, Comoros, Congo, Democratic Republic of the Congo, Côte d’Ivoire, Ethiopia, Gabon, The Gambia, Ghana, Guinea, Guinea-Bissau, Kenya, Lesotho, Liberia, Madagascar, Malawi, Mali, Morocco, Mozambique, Namibia, Niger, Nigeria, Rwanda, Senegal, Sierra Leone, South Sudan, Swaziland, Tanzania, Togo, Tunisia, Uganda, Zambia, Zimbabwe, 8 Regional Economic Communities and 2 African institutions: UNECA, AU/NEPAD.